a type of germ cell tumor made up of a number of different types of tissue from one or more of the germ cell layers; it is usually found in the ovary or testis and may be either benign or malignant. malignant teratoma a solid, malignant ovarian tumor resembling a dermoid cyst but composed of immature embryonal or extraembryonal elements derived from all three germ layers. A type of germ cell tumor composed of multiple tissues, including tissues not normally found in the organ in which it arises. Teratomas occur most frequently in the ovary, where they are usually benign and form dermoid cysts; in the testis, they are usually malignant; and, uncommonly, in other sites, especially the midline of the body. 1. a solid, malignant ovarian tumor resembling a dermoid cyst but composed of immature embryonal and/or extraembryonal elements derived from all three germ layers. A tumor consisting of different types of tissue, as of skin, hair, and muscle, caused by the development of independent germ cells. a tumor composed of different kinds of tissue, none of which normally occurs together or at the site of the tumor. Teratomas are most common in the ovaries or testes. A tumour derived from the multipotent cells of more than one primitive embryonic layer (ectoderm, endoderm, mesoderm), which differs in prognosis according to the organ involved and degree of maturation of the tissues; teratomas are most common in the mediastinum, ovary and testicle, but may occur in the urogenital tract and various solid organs. A neoplasm composed of multiple tissues, including tissues not normally found in the organ in which it arises. Teratomas occur most frequently in the ovary, where they are usually benign and form dermoid cysts; in the testis, where they are usually malignant; and, uncommonly, in other sites, especially the midline of the body. A tumour formed from germ cells showing various degrees of differentiation. Most teratomas occur in the ovaries or testicles. Some teratomas are benign, some malignant. Type of germ cell tumor composed of multiple tissues, including tissues not normally found in the organ in which it arises. n a tumor composed of cells capable of differentiating into any of the three primary germ layers. Teratomas in the ovary are usually benign dermoidal cysts; those in the testis are generally malignant. a true neoplasm made up of a number of different types of tissue, none of which is native to the area in which it occurs; usually found in the ovary or testis. See also dermoid cyst. 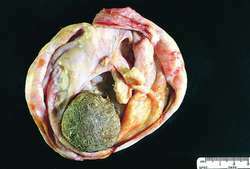 a solid, malignant ovarian tumor resembling a dermoid cyst but composed of immature embryonal or extraembryonal elements derived from all three germ layers. Fromer said limbal dermoids are made of a tissue similar to that found in the body that allows for the formation of hair follicles. A limbal dermoid may occur as part of the Goldenhar syndrome. SCALP###The coincidence of sebaceous nevus syndrome, central nervous system malformations, aplasia cutis congenita, limbal dermoid, and pigmented nevus (giant congenital melanocytic nevus).